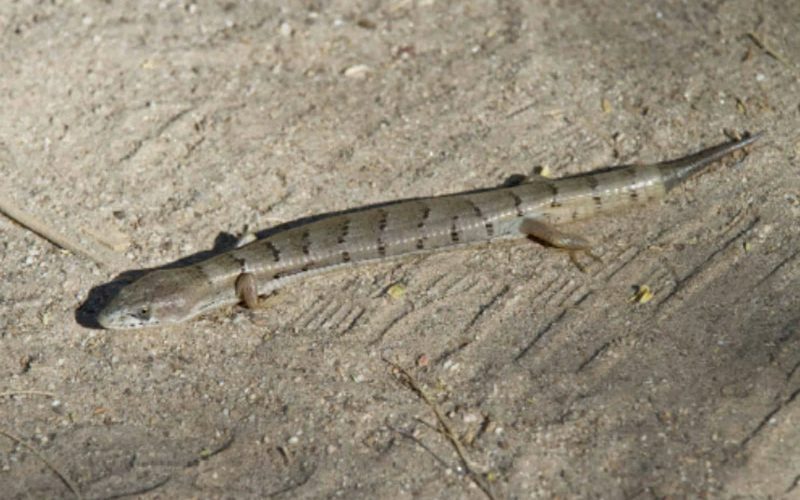 The Madrean Alligator lizard is active during the day and evening. The Madrean Alligator Lizard is a large (to 5.5 inches), shiny, long-bodied lizard with relatively small limbs and a long, thick tail. The back and belly are armored with stiff, rectangular, plate-like scales. A soft fold of skin on each side allows the body to expand for breathing. Coloration is gray or tan with chocolate or reddish brown crossbars that have dark posterior edges. Often has crisp white markings on the sides of the face. Young have crisp, nearly black banding on the body and tail and dark coloration on the limbs, feet, and lower sides. They occupy low valleys, rolling foothills, and steep mountain slopes in communities ranging from Semidesert Grassland through Petran Montane Conifer Forest. The Madrean Alligator lizard is active during the day and evening and is a ground dweller often found foraging in leaf litter or under rock piles, rat nests, fallen logs, or dead plants. They seem to be most abundant in wooded canyons or along drainages. This photograph was taken in May 2010 at lower Sabino.